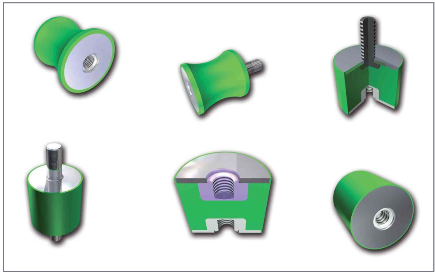 A complete range of mounts, which can be fixed in alternative ways with both internal and external thread and used in compression or shear. It is not allowed to use in tensile load. They come in various sizes from Ø 8 mm to Ø 150 mm. Loads varies from 5 N up to 1000 daN. Load can be at pressure load as well as on shear load.